chance to stitch almost anything. giveaways and tips to sew with precuts. 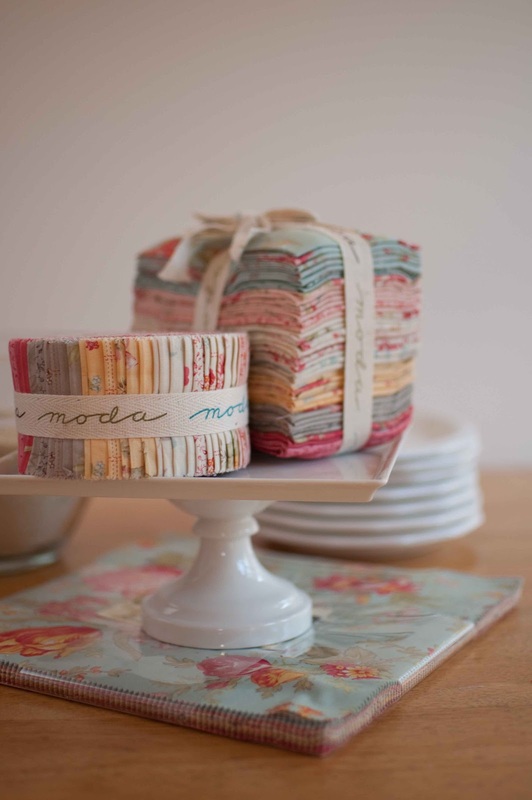 If you have never sewn with any of the Moda Precuts now is the time to give it a try. 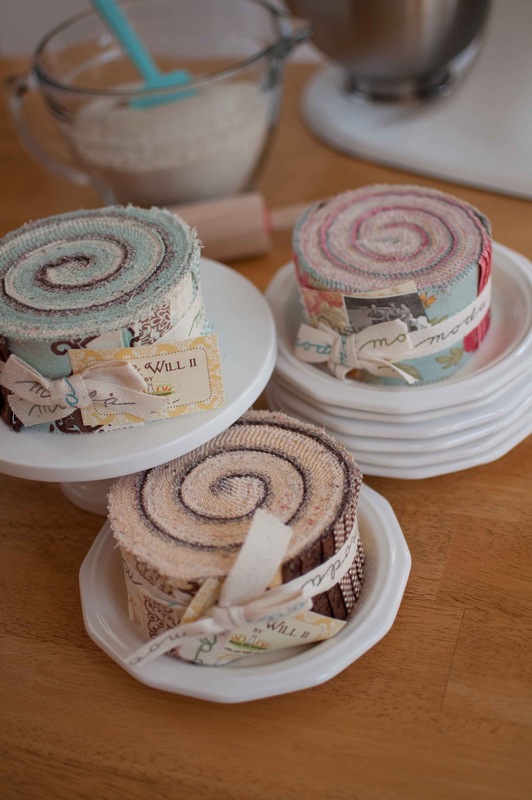 I will never forget the first time I used a jelly roll. I went home from work, started dinner, unrolled the jelly roll and actually started sewing. No pre-cutting, planning or fumbling through sets of templates. I couldn’t stop. I almost burned dinner! make quilting with the moda precuts a breeze. printed on the back of every layer cake package. A layer cake is a set of 42-10″ squares. 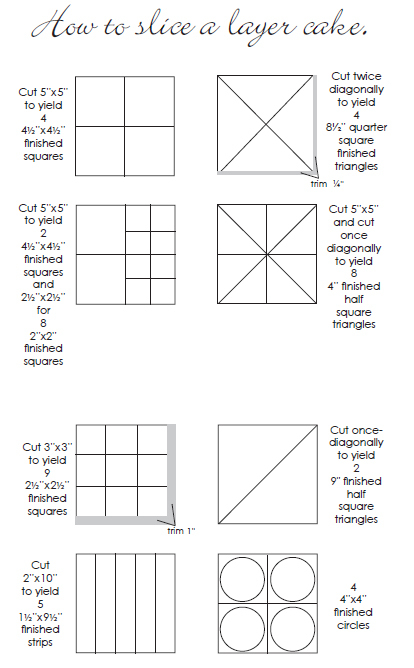 to make a quilt top that measures 57″ x 66 1/2″. Enjoy Martingales selection of books chock full of ideas and designs. dinner to dive into your next project. Love the section on what you can cut a pre-cut into. That really puts ideas into my head. I always think that a precut means use it just like it is. BUT.. not so much. It is just a nice time saver and a pre-packaged way to get a lot of fabric selection in a nice tidy little package. LOVE this. Love the tutorial and the precut plate photo is very nice.Love these photos! 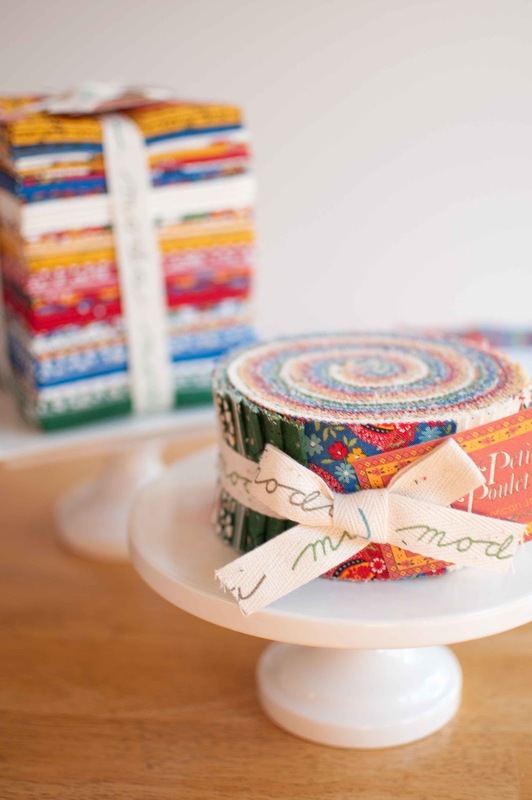 I use charm packs and jelly rolls more than layer cake,I don´t know why. I love to use precuts because they are such a time saver. Thanks for posting the tutorial on the many ways to use them. I love Moda precuts. I find precuts great for getting a lot of different fabrics without having to buy larger cuts. As it says on some of the packaging though, sizes may vary slightly, and I have never had a perfectly square layer cake or charm pack, or straight jelly roll strips, or any precut cut on the grain. For accurate piecing, trimming is often necessary, which I think is an important thing to keep in mind. I am loving moda precuts. I was asking the lady at my local store today for ideas on making quilts out of charm packs. I am looking for anything more than the nine patch and disappearing nine patch. I’m hoping to read a book to get some ideas. 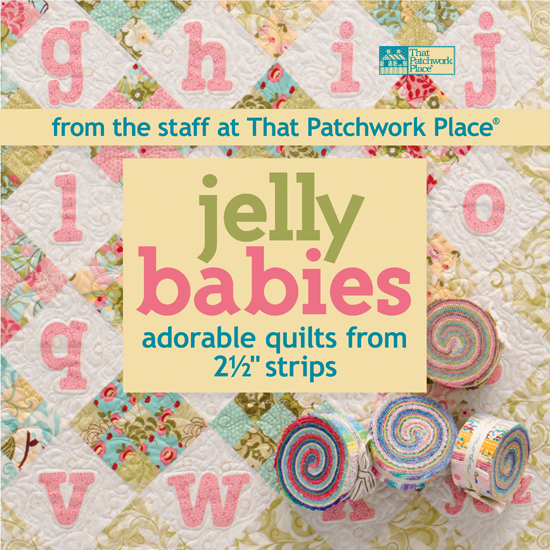 Ashley, you may want to try Schnibble by miss Rosie’s quilt co. They are wonderful! Until you posted this about the layer cakes. I have bought them before but never noticed the instructions on how many ways you could cut them. Oh my goodness, nothing like eyes wide shut.